Tetroxy® is a global brand, delivering effective treatment and control of organisms sensitive to oxytetracycline. 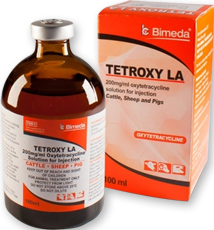 In Ireland, we offer the 100ml Tetroxy® LA Injection, which is licensed for use in cattle, sheep and pigs. For many years, Irish vets have placed their trust in this high quality, long-acting oxytetracycline injection, which continues to deliver excellent results for vets and their clients. What’s more, we also have excellent advice on best practice and responsible use from Bimeda’s Technical Veterinarian team.